We are looking for energetic, creative and FUN people. 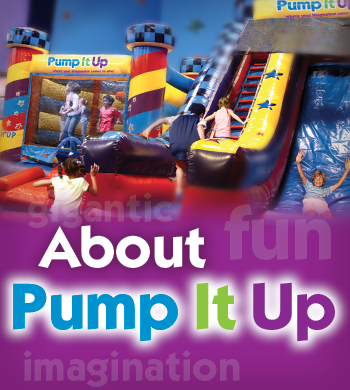 We have the PERFECT job for you at Pump It Up! Candidates need to be outgoing, comfortable speaking to small and large groups and be able to organize games and activities with children. Strong customer service skills are a must. Position is part-time only and requires night and weekend work. Shift manager hours may be different then general staff. Hours vary between 5-15 hours per week. Must be at least 16 years old. Must have reliable transportation. Previous experience with children and/or teaching a plus. Customer service driven and self-motivated individuals are encouraged to apply! MUST LOVE KIDS!